The MCX1000 mobile is an excellent radio. It has a very tight front end, it sports a 7 segment "starburst" type alphanumeric display, and it has a LOUD 10W of audio! The radio comes is two physical flavors, the under dash mount, and the remote head mount, both in either 56 or 128 modes. To determine what type of MCX1000 you are looking at, check out the model breakdown chart. The service manual is OUTRAGEOUSLY PRICED, thanks Ma M., I know, I bought it. All you get is a fancy photocopy of the original, three hole punched to put in your own binder! If you really want to order it, the part number for the VHF version is 6802902A56. If all you need are the pinouts off the radio, check out the accessory connector , or the mic connector, or if you need to power it, check out the power connector, or if you need to program it, check out the programming cable. Also, a programming hint... in typical Motorola fashion, there is an option available for these radios which makes a 128 channel radio capable of only 56 channels. So, if your model number should be 128 channel, but you can only program 56 channels, check and I bet that it has the 56 channel option enabled in the options menu. The only way around this is to perform the 128 channel upgrade listed below. Used microphones are all but impossible to find, and new ones from Motorola are both expensive, and soon to be unavailable. It is much easier to convert a readily available mic from a Maxtrac series radio. This procedure is quite simple. It involves the replacement of the RJ-45 connector, or opening the mic and rewiring it. The microphone only needs 4 wires, note the 5 that are used in the original design. 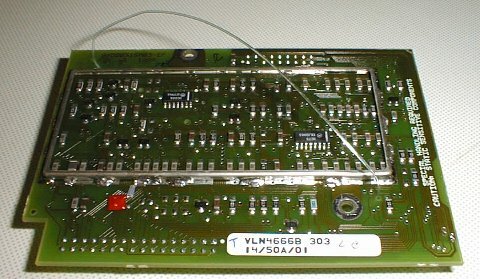 The OEM mic switches the PTT to Logic Ground, which is also used in programming, however PTT works fine with chassis ground. Also, on the back of the radio, the left-most connector is another microphone connector. It uses the same microphones as the MCX-100, Mitrek, Micor, the MX Converta Com, and the older Syntors. The pinout of the connector can be found here. Note that some microphones may or may not have the hangup switch installed and the associated pin. If you have a VLN1017A DTMF microphone from a MCX1000 and are looking for a schematic for it... look no further. It is available in the service manual, or, you can look at Tone/Logic Board and the Microphone/Beeper Board schematics. This board layout will make locating the proper jumpers a bit easier. Note that if you have a Maxtrac TDN8310A DTMF microphone, it uses the same schematics, with slightly different part numbers. A "fatal" error occurs when hardware or firmware necessary for normal operation fails. The firmware attempts to display a message and shut down the system. If hardware or firmware associated with the display fails, this attempt may be unsuccessful. The only radio operation allowed is programming with the service programmer. A "non-fatal" error occurs when hardware or firmware not necessary for normal radio operation fails. The firmware attempts to display a message and then allows normal radio operation to continue. Ensure that the solder joints, connectors, and cabling to the failure location are intact and making proper contact. Ensure that the serial bus (BUS+, BUS-, BUSY, RX DATA, and TX DATA) lines are functional. Upon completion of the power-up self test routine, the radio attempts to display an error message if a problem has been encountered. This error message is displayed only for several seconds immediately after the self test routine is completed. Table 1 below contains a listing of the possible power-up error messages and information about these messages. Table 2 contains other messages which may be displayed during normal use of the radio. FL 09/90 SecureNet Board Fatal, Hardware Failure Radio is programmed for SecureNet. SecureNet Board is not installed properly or has failed. Verify installation and troubleshoot as required. ER 0C/10 Guard Receiver Hardware Failure Radio is programmed for a guard receiver. The guard receiver is not installed properly or has failed. Verify installation and cabling and troubleshoot as required. If you go and look at the channel(s) you changed while under the correct bandsplit, the software will have a fit and not display them, however, they are still there. This modification is not for the novice to attempt, it involves the removal and installation of a 32 pin surface mount IC in tight quarters. The first thing you have to do is get your hands on the chip. A device we have tested without any problems is DigiKey part number 28C64A-20/L-ND. You need an 8kx8 EEPROM (28C64) in a 32 pin PLCC package. 1) Observe the rear of the radio, notice that the cover for one side of the radio has 2 screws and the other has only 1 screw. Remove the cover with only 1 screw. 2) Refer to the picture and locate the 2 screws indicated. Remove them and the metal shield that is now loose. 3) Pull firmly straight up on the "fishing line" and the computer logic board should come out. 4) You should now be holding a board like that in the picture with a part number of VLN4666B, this is a 56 mode board. 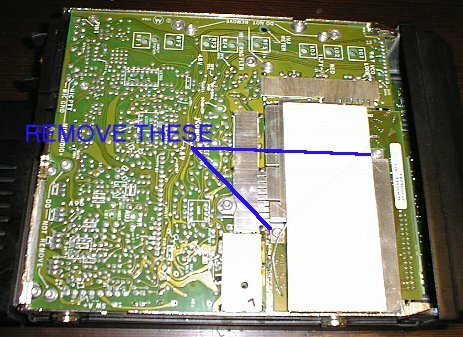 5) The IC that has to be replaced is located on the other side of the board under the shield and is indicated in the picture. 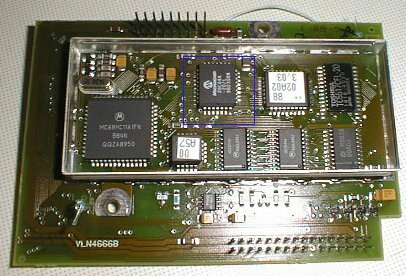 6) Once you have replaced the 2kx8 EEPROM with a new 8kx8 device, button the radio back up. 7) Load up the RSS, select the model you want and create a default codeplug. 8) Dump the new 128 mode codeplug into the radio and you are done! Changing out the EEPROM gives the radio a blank codeplug to be reprogrammed, but it still knows its serial number. Looks like there is a bit of info probably hard coded in the micro controller. We haven't found any way of "blanking" the logic board yet, but changing the EEPROM could be a viable option if you can't find any other way to get the radio to accept a different model codeplug.